Welcome to Flawed yet Functional! Eating whole, fresh, healthy food is critical to your well being. But you can only do so much each day! I’m human just like you with limited energy and time to devote to cooking. I know how time consuming the AIP diet can be, so I’d like to share with you my top 4 ways to save time in the kitchen while on the Autoimmune Protocol. Mornings are hard. Everyone needs to get someplace so breakfast can easily turn into a rushed affair. Make it easier on yourself by cooking large batches of breakfast then reheating as leftovers the next day (or two!). I regularly do this with hash. It takes me about an hour to make the first day (Not all that time is actively cooking, about 60 minutes of baking and 30 minutes of active cooking. ), and I always make enough for at least one more meal. Then I plan the “fresh” meal for a morning we don’t have to go anywhere early and the leftovers for a busy morning. Variety is the spice of life, and I love varied meals as much as the next person. In fact, in my family I am the one who is least likely to eat leftovers for many days in a row. However, if you have fewer meals in your menu planning rotation, meals will come together easier as you will know the recipe by heart. It is so much quicker to cook from memory than needing to check a recipe every step or two. Try rotating between two or three breakfast or dinners throughout the week. What I’ve been trying lately is making one week menu plan then just duplicating it the second week. I’ve only tried this once and my kids haven’t complained, and it’s been much easier on me. I don’t mean to beat a dead horse, but leftovers are such a time saver! Learn to use them well! Plan on leftovers for lunch whether you eat at home, at work, or at school; take a leftover sack lunch. It is super quick to pack a leftover lunch especially if you think ahead the night before. If you made soup for dinner, grab a small lunch size container and fill it up before you pack up the rest of the soup in the fridge. That way most of your lunch is ready to go the next morning. Toss in some veggies and fruit or a snack, and your sack lunch is ready to go. Don’t have access to a microwave at work or school? These thermoses are awesome. We’ve had them for years and use them regularly. They keep your food hot for 9 hours! For the days that the leftovers run out, keep easy lunches on hand. Our go-to’s for an easy lunch are salami and crackers or tuna patties (see above for not needing variety!). Make your go-to fresh lunches still very simple to keep lunch prep and cooking quick. This summer has enlightened me to the idea of simple grilled dinners. Did you know that most dinners that everyday Americans eat off the grill are AIP and Paleo friendly? (If you leave off the bun that is!) Here are some of our staple, simple meals. 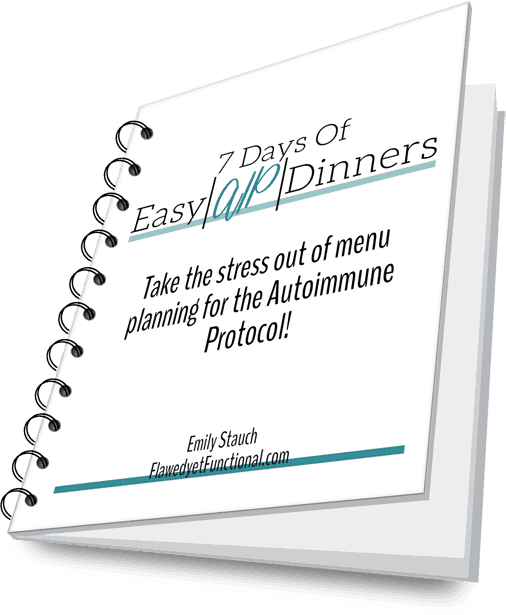 Even though the Autoimmune Protocol is tough and time consuming, I believe it is 100% worth it. Stopping the autoimmune reaction in my body (along with not needing additional insulin!) is worth the effort. 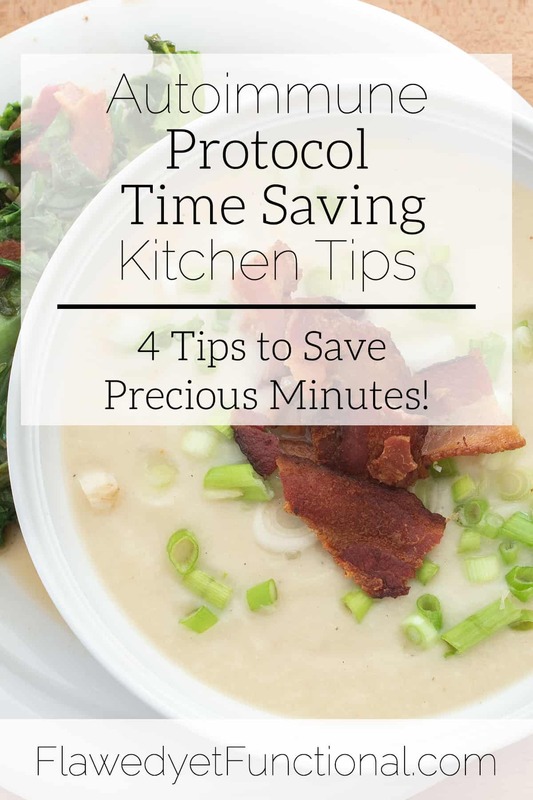 If you are thinking of trying AIP, try these top 4 ways to save time in the kitchen while on the Autoimmune Protocol because your time is precious. Minimize the time you spend in the kitchen so you can spend it with your family or doing something else you enjoy! What do you do to minimize your time in the kitchen? Do you have time-saving tips or hacks to share? What do you want to spend more time on that drives you to look for efficiencies in the kitchen?